The house is coming along nicely - although I've had no chance to do any blogging at all - on any of my blogs! Seems I have a bit of catching up to do all over the place. How gorgeous is that Range Cooker? Personally I think it's just a wee bit too big... but I'm using it anyway - it's metal, heavy... and the door opens too! 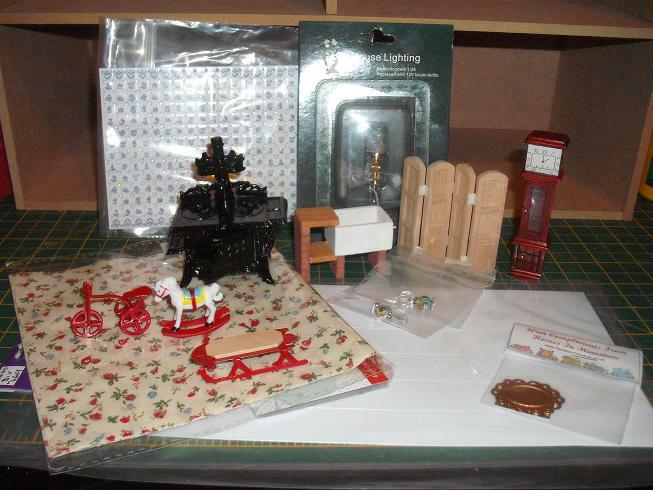 The choice of "Forever Christmas" in my dolls house means that I can buy all the fun stuff - like the little red sled. Hmm... "Forever Christmas" ... I like that - may even choose that as the name for my dolls house. I'm altering the screen, as I need it to be black and gold for the bathroom, and that grandfather clock just screams out for a nice round face instead of the square one it has right now.